MATTA Fair Organising Chairman, Wan Zakaria Wan Yusuf (seated centre) and MATTA Sarawak Chapter Chairman, Dayang Azizah Abang Zaidan (seated second left) with MATTA Fair committee members, exhibitors and travel agents during a press conference in Kuching. KUCHING: 18 travel agents and seven banks will be participating in the 13th Sarawak MATTA Fair 2018 to be held at CityOne Megamall here from 7 until 9 September. The travel agents are Ibanika Tours Sdn Bhd, Orient Holidays Sdn Bhd, Ming Ming Travel Services Sdn Bhd, Good Times Travel Sdn Bhd, Borneo Exploration Tours & Travel, Hong Tai Travel Sdn Bhd, Cat City Holidays Sdn Bhd, Multiclient Travel Sdn Bhd, Sak Soon Travel Agencies Sdn Bhd, Holiday Tours & Travel Sdn Bhd, Timeless Vacation Sdn Bhd, Bel-Air Travel & Tours Sdn Bhd, Inter-Continental Travel Centre Sdn Bhd, Summer Holiday Travel Car Rental Sdn Bhd, Lung Chia Pin Travel & Tours Sdn Bhd, All Borneo Connection Tours Sdn Bhd, Our Deen Travel & Tours Sdn Bhd and TH Travel & Services Sdn Bhd. 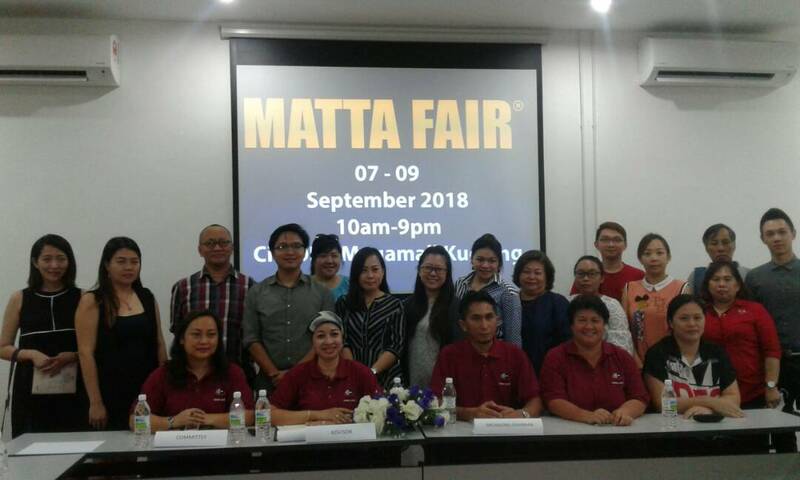 “MATTA Fair is recognised as the major event for Sarawak Chapter every year and known as a great event which provides amazing opportunities for exciting holiday packages, flight offers, lucky draws and several other activities. “At present, there are 78 booths in total for this three-day event participated by 18 travel agents and seven banks. “In addition, the event has been receiving support from various organisations such as Malaysia Airlines, Hilton Hotels, Harbour View Hotel and Merdeka Palace Hotel,” said the Organising Chairman Wan Zakaria Wan Yusuf during a press conference here on Tuesday. He added that MATTA Fair has been acknowledged as a platform for travel industries to promote their variety of travel packages which was to foster and enhance the teamwork in the industry as well as a great way for the people to obtain special offers of the travel packages under one roof. The participating travel agents will be showcasing their choice of attractions, activities and services to fellow stakeholders in the industry as well as the public at large. Wan Zakaria also expected that there would be a 20 per cent increase in sales of holiday and travel packages as well as various offers from the upcoming 13th Sarawak MATTA Fair 2018. He disclosed that from the event in September 2017, the sales was RM6 million while in March 2018, there was a 20 per cent increase in sales which was RM7.4 million. He added that the previous MATTA Fair had attracted a total of 12,000 visitors and was expecting an increase of 20 per cent for the upcoming event. Travel and tourism related businesses are encouraged to participate and engage in the fair. Members of the public are also encouraged to visit the fair to obtain insights into the travel packages offered. The fair will be held at CityOne Megamall here from 10am to 10pm on 7 until 9 September, 2018. Entrance is free for children while adults will have to pay RM2 which will entitle them to various lucky draw prizes such as flight tickets, Apple IPhone 8 and Huawei smartphones. MATTA Fair returns Sept 7 0 out of 5 based on 0 ratings. 0 user reviews.